Heavenly blog! : No. 851: No one who is re-married as a Christian may or must be preachers, pastors or Apostles! A new marriage makes them unfit thereto! No. 851: No one who is re-married as a Christian may or must be preachers, pastors or Apostles! A new marriage makes them unfit thereto! No one who is re-married as a Christian may or must be preachers, pastors or Apostles! A new marriage makes them unfit thereto! This is not my words, but what scripture says and teaches. 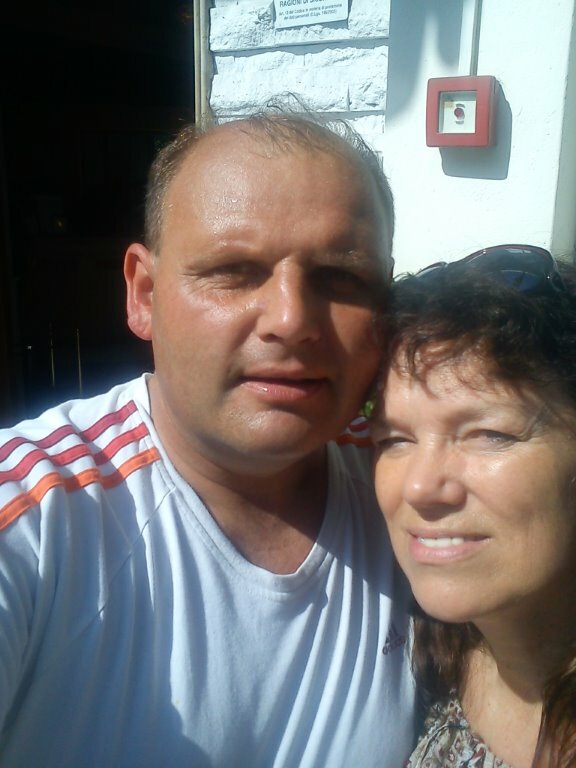 Picture of me and my wife Berit, we are now approaching soon thirty years together. Not bad in today's society where, inclusive preachers, pastors and apostles who live in Noah and Lot days of taking the real and give to true. Taking with anything I've written before that is very clarifying, concise and consistent with scripture. Importance of this is also reflected by the fact that the Lord took this up with the 6th commandment says "Thou shalt not commit adultery," or that it can also be translated: "Thou shalt not commit adultery." There are some basic principles in everything that the Bible speaks about marriage. There are things that are immutable, they belong to the created order. God emphasizes this when he says in 1 Mos. 2:24 "Therefore shall a man leave his father and mother and cleave unto his wife: and they shall be one flesh." Jesus also refers to this when he speaks of marriage in Mat. 19: 3 ff. The spouses shall be one flesh, and jointly share both joys and sorrows that this entails. Bible puts marriage into a social and legal context. In the word of 1M 2:24 says that "man shall leave his father and his mother." This means he goes from a legal and social context and into another, where it is clear to everyone that these two by marriage has formed a new unit that will last a lifetime. Out of God's word will not help out a legally binding confirmation that marriage is entered into. The Bible has no formula for how a marriage shall be entered into. Society arrangements for the marriage is valid, if they do not violate God's word. It is important to emphasize is that marriage is a legal change of lifelong relationship status undertaken in full transparency and confirmed by the couple, their parents and the authorities. For a Christian, it is natural that marriage also entered into under God's word and prayer. A cohabitation missing all biblical grounds. It is built on subjective emotions and private decisions. Cohabitation is unwillingness to take a decision of the lifelong nature and a desire to live together sexually without taking on the obligation of the Bible relates to such unions. The Bible says that divorce is contrary to God's will. Jesus says in Matthew 19: 4-6: "Have you not read that he who created them from the beginning made them male and female, and said: Therefore shall a man leave father and mother and cleave to his wife, and the two shall be one flesh? So they are no longer two, but one flesh. Therefore what God has joined together, let man not separate. "See also Mark 10: 6-9; Luke 4:18 p.m.; 1 Corinthians 7: 10-11. The New Testament has two specific exceptions where divorce is not a sin. The one exception is found in 1 Corinthians 7: 12-16. Here is what an unbelieving spouse who requires a divorce if the other does not want to enter the Christian faith. And when the other dies. Rom. 7. 3 As long as man lives, the one who committed adultery if she marries another. But if her husband dies, she is free from the law no adulteress if she marries another. Other exceptions are not mentioned in the NT. Bible also speaks clearly in this case. In Luke 4:18 p.m. says: "Whoever divorces his wife and marries another commits adultery. And whoever marries a woman divorced from her husband commits adultery. " Jesus' words in Mark 10: 11-12 is not to misunderstand: "Whoever divorces his wife and marries another, is guilty of adultery against her. And if a woman divorces her husband and marries another, she committeth adultery. " Paul writes equally clear in 1 Corinthians 7: 10-11: "To those who are married I command, yet not I, but the Lord: A wife must not separate from her husband. But she is separated from him, let her remain unmarried or be reconciled to her husband. And a husband must not divorce his wife. " We note that Paul refers to a decree from the Lord. It is given only two possibilities for the divorced wife or husband: to remain unmarried, or be reconciled to her husband. But anyway is a divorced as believers and holds a service, so stricter criteria. It says there are several places in Paul's teaching that one should be a woman's man (see Pastoral letters). What then? When it comes to marriage, then it is not permissible for a minister to marry again under any circumstances, then disqualifies himself for the office he has received. It's like an athlete whale legs himself, he is no longer fit to be an athlete, if he wants to. A preacher should be a woman's man, we see Paul teaches about time after time. (1 Tim. 3.2 and Titus 1: 6). Should anything be unclear here, so I recommend to submit a question to our blog or write something yourself there. This should and should have been a common Christian understanding where not gjengiftede got and could go far and round. There are spirits, demonic such as follows in the footsteps of loose sexual and moral life. Including Derek Prince who was a great Bible teacher married a divorced, this course was never God's will. Hopefully he was saved although he did against God's will. From my commentaries Titus 1. 5 I left you in Crete that you would bring order to the thing that was still undone. You should appoint elders in every city, as I instructed you. It was with great confidence and affection Titus got this assignment. To arrange church after God's pattern where elders should be inserted that would lead the congregation and be responsible for the further way forward, primarily spiritually. 6 An elder must be no criticism of, He shall be husband of one wife, his children must be believers, not insolent and not be accused of living a wild life. An elder who is a man of learning and pastoral responsibility should be a high inntregeitet. Have children who are trained in and the Lord's way. And that manages and customs well as in particular with his family. Furthermore it says that he should be a woman's man. Here we can not misunderstand Paul's words when it stands with apostrophe over; one woman man. In some cultures it is polygamy as the Bible, especially the New Testament warns against. There is a man and a woman who is the God-given marriage form everything else is man-made. To focus on anything else is a total derailment and discuss whether it is biblically with gay and lesbian relationships are a waste of time and the wrong focus. God created us male and female, period. Now we need to see this in the light of God's word. To enforce such a high standard that the word of God assumed in marriage applies ONLY believers. Especially those with an overseer. If one believer is separated can continue in service, but without shepherd and teacher responsibility (the same mandate woman). If one remarries then we must relate to what God's word says about this. We will take up remarriage much deeper when we come to other passages but will only say briefly that two believers are remarriage excluded while the other lives. It is permitted only with remarriage for a believer if the other dies physically. But no matter if a believer who has a supervisory office remarries he shall never have a platform service. Remarriage whether it is legal disqualifies him or her to have a service in the church of God. Marries one again without a biblical basis, he shall be expelled by the church if one will not repent. Some Christian preachers marry divorced both first time and after they have been widowers is profaned and it disqualifies them to have an overseer. Then it is necessary that not only seems not right with remarriage. But simultaneously and support to ministers, elders and others who are remarried. Make a it, then runs Satan's errand. Is this strange? Think of a workplace where a person repeatedly fails or will not do their job, then it is not unfair that he loses his job? God is then not dumber than an entrepreneur? Or should we do word of God? So it is in the kingdom of God and in God's church. No gjengiftede as believers are allowed and must have a platform service. And those who support such supports Satan and his demonhær. And those who refuse an overseer to marry again, also run errands Satan (1 Tim.4.1-5). We see today that there is no obstacle in the church of God with two, three and more marriages behind him to preach the word of God. But this is nothing new, they come under the judgment we find in God's word many places and those who support such also come under the same judgment. Remarriage among overseers is and remains sin. 1. Tim.5. 15 Some have already turned away and followed Satan. Can one not to get it in marriage and chooses to remarry, then conducting a curse if one wishes to have a service. But choosing one to resign from his service, the grace is greater (Luke 18)! There is no human right to possess a favor when one fails in his everyday life and his family. 1. Tim.5. 8 One who does not care for their relatives, and especially for his immediate family, he has denied the faith and is worse than an infidel. This I write here is true and sober words, not out of aggression and helplessness. Jakob 3.1. Not many of you should become teachers, knowing that we will be as much stricter judged. It is clear, the mission hangs so high that it is not a foregone conclusion that we are worthy of it without our lives also agrees with what we teach and preach. God has his standard, also under the old covenant. 3. Genesis 21. 7 None of them must marry a harlot or a woman who is dishonored, nor a woman divorced from; the priest is holy to his God. Ezekiel 44. 22 They must not marry a widow or a woman divorced from, but only with virgins of Israel. But they can take the widow of a priest. 7 For a bishop is God's steward, and there must be no criticism of him. He must not be self-willed, hot tempered, drunkard, violent or looking covetousness. An overseer manages both spiritual truths and people belonging to Christ. The properties he should have been of the Spirit fear and they belong to a mature man. Not headstrong must accept other people both them and their views. Do not get angry fast and not be under alcohol or other things. Violent or looking to monetize the work of God. 8 He will be hospitable, loving what is good, be self-controlled, upright and godly and master of himself. Should one have to do with people must be sociable, therefore hospitable. Love the good is also to love life, thus be positive. I have always tried to set up everything for the kids so comes a also in contact with other one they encounter otherwise. Could restrain himself also when things go against and be upright in all parts, especially money and moral thing. Further it states; godly and master of himself. A good mature person in every respect can safely say. 9 He must stick to the faithful word according to the doctrine, so that he both able to direct by sound doctrine and to refute the claims of those who say the contrary. Love his Bible and know it and be ready in their understanding of God's word. Also able to apply the word of God and refute people who come with unbiblical opinions and empty misled in their lives as believers. One should also reveal and point the word of God in the face of other people.